When things get a bit crazy one of my go-to stress relievers, cooking, is often the first casualty. I start eating out more or ordering takeout and the next thing I know its been a good two weeks since I've cooked a real meal. Part of this whole month-long exercise of renewal is, for me, a recommitment to spending time in the kitchen. I am fully aware of the benefits cooking brings; it makes me less stressed, it brings me joy to feed myself and my loved ones, it saves money. I just need to carve out the time, to make cooking a priority. This recipe is one I've made a few times in the past, but it seemed appropriate to share now that I'm in Hawaii. Fruit, especially the pineapple, reigns supreme on the Hawaiian islands. Within a 30 second walk from my brother's front door I can pick lemons, limes, or avocados. It's no wonder then that fruit plays a huge role in Hawaiian cuisine. This salad, while originally based on one from the Caribbean, would be just as at home here on Kauai as it would on a dinner table in Barbados. 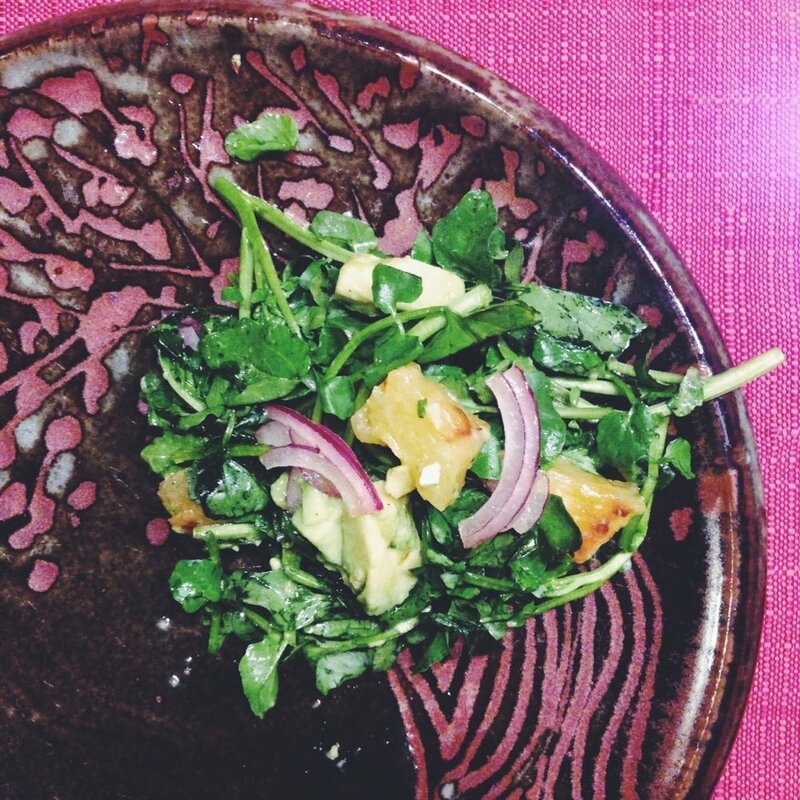 So if you're feeling a bit out-of-sorts and cooking is one of your stress-relievers, like me, take a few minutes to brighten your day with this tropical salad. Bonus points if you can enjoy it overlooking the beach, but at the very least turn on some reggae and transport your kitchen to the islands. Turn your oven broiler to high and position a rack in the lower third of the oven. Toss the pineapple with 1 Tbsp sugar and spread on a baking sheet. Broil until browned and caramelized, tossing a few times, 15-20 minutes. Keep an eye on it! Remove and set aside to cool to room temperature. Chop off the thick stems of the watercress and discard. Rinse it to remove any dirt, then put the watercress in a large serving bowl. Peel, quarter, and thinly slice the red onion. Add the to watercress. Halve the avocados. Remove the pits and cut them in a cross-hatch pattern (to create small cubes). Using a spoon or knife gently dislodge the avocado pieces into a small bowl. Toss with 1 Tbsp. of the lime juice and set aside. Finely chop the garlic. In a small bowl whisk together the chopped garlic, olive oil, remaining 2 Tbsp. of lime juice, and cumin. Add salt and black pepper to taste. Assemble the salad just before serving. Top the watercress and onions with the pineapple and avocado. Pour the dressing over the salad and gently toss.